When you hear about Damyang, it naturally reminds you of Metasequoia Road. However, if I have to pick one place you shouldn't miss would be Gwanbangjerim Forest in Damyang. This is located in front of Bamboo Forest in Damyang and it is full of 200 to 300 year old trees. The entire dense forest becomes a cool place to rest with water flowing along Gwanbang Stream in summer. Gwanbangjerim Forest is connected to Metasequoia Road so you can't possibly miss the joy when you slowly walk from the entrance of Gwanbangjerim Forest to Metasequoia Road. I've been there often in summer and fall but never in winter, so when I heard the news that it was going to snows in Damyang I simply had to be there. 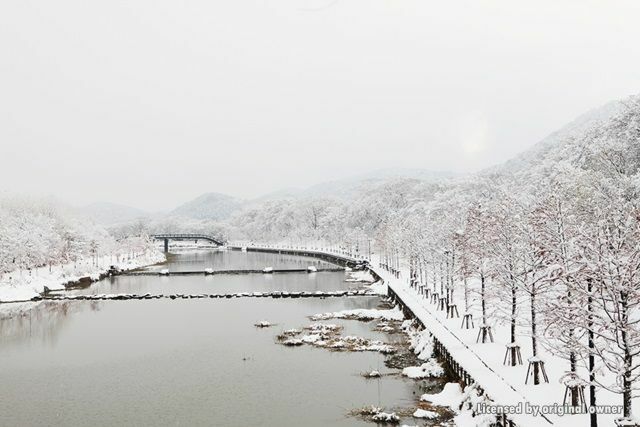 This is snowy scene in Gwanbang Stream of Gwanbangjerim Forest. That was completely different view of Gwanbangjerim Forest which was white world. In summer and fall, this place is crowded with people but I could see few people when I got there probably because of snow and the view was so beautiful. Normally I see a lot of people on bicycle but I couldn't see this time, also because it's winter. Only the benches were keeping their seats watching Gwanbangjerim Forest being covered with snow. Just as I expected, I saw someone who is just like me in this snowy weather. Places with great views always have visitors with cameras. This visitor was so focused on taking pictures of Gwanbangjerim Forest from different angles. I started to see people coming here from somewhere to take a walk in Gwanbangjerim Forest covered with snow. As time went by, people appeared and took photos. They were having fun in the snow, they must be friends. A guy walking his dog. He's happy to see the puppy playing. I don't know why puppies love the snow so much. Are they jumping around because their paws get cold? Trees covered with snowflakes make the view more romantic. There are various places for us to rest in Gwanbangjerim Forest. Including benches and rest area like a cabin. 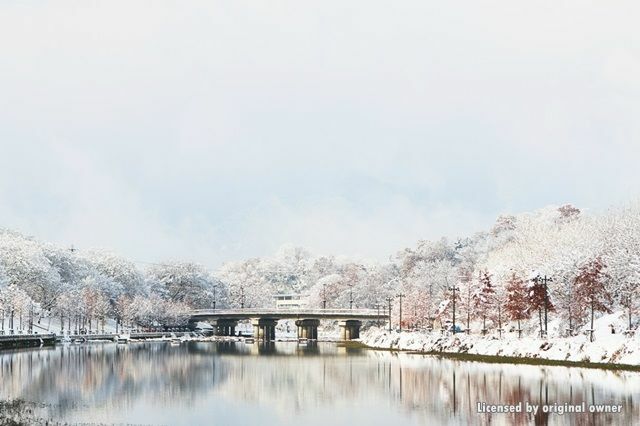 Gwanbangjerim Forest of Damyang with various scenes in each season, along with Metasequoia Road, is one of beautiful streets representing Korea. After a walk from Gwanbangjerim Forest to Metasequoia Road, try to eat a warm bowl of noodles on Damyang noodles street right at the entrance of Gwanbangjerim Forest and take a look around Bamboo Forest nearby. It's a good travel course in Damyang. If you are planning to travel Damyang, don't forget to visit Gwanbangjerim Forest on your way in or out of Bamboo Forest.